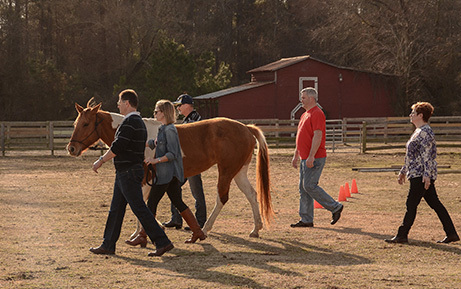 Lori Bush, Technical Lead, Learning at Cisco by day, and Cary Town Council At-Large Representative by night, has ventured out to TeachingHorse for two separate programs. She did not initiate her first experience; rather, as a member of the Friday Fellowship, she was invited to take part in a two-year leadership program aimed at returning civil discourse to the community. “I knew nothing about TeachingHorse,” she remembers, and went there “with a bunch of people I never knew before.” Like so many other leaders who experience personal and group growth at TeachingHorse, Lori decided to make a second trip, scheduling her Cisco group to go there with the objective of developing relationships among her work team. At TeachingHorse, they hoped to answer the following question: “How do we create synergy—foster family and teamwork—in a virtual global environment?” And predictably, the reaction to the news that they were off to a horse farm ran the gamut: uneasiness, curiosity, and excitement. Perhaps the most interesting response was, “Wait, we’re not riding the horses?” In fact, participants do not ride the horses at TeachingHorse, but that certainly does not mean that the experience is not fun and memorable. After all, Lori had been there in the past, and she knew that a TeachingHorse program was both enjoyable and valuable. She recalls, “I thought I had this perfect view of what it would be.” And that is when the real story commenced. The truth is that her second trip to TeachingHorse was nothing like the first. One of the learning exercises was to ask a horse to move, leading it with calmness and deliberation. 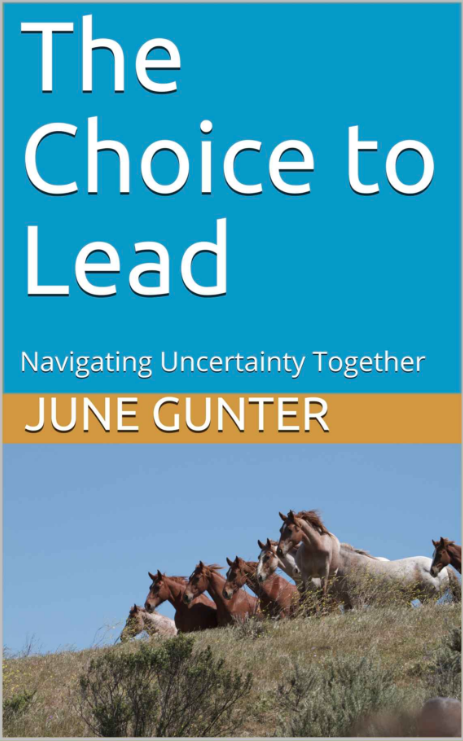 Only “the horse didn’t move,” she says, “and we actually had to have June help.” That is when things got really interesting because—for whatever reason—even June was unable to facilitate the desired behavior. As a group they had the opportunity to learn about what happens in an organization when things do not go as planned. Specifically, she remembers learning “intentionality approaching problems; we had to stop and assess. How do we persevere and get to the finish line?” At that moment, all of the individuals are able to showcase their own leadership styles and traits, and together they combine them to search for answers. A central tenet at TeachingHorse is that team success can be built and maintained even in the face of uncertainty and struggle. The key is to collaborate with group focus, and to shift roles as situations evolve. Because of their challenge at TeachingHorse, they emerged with much more than a unique memory; Lori says that her team learned to “be brave together and build confidence in difficult situations.” It is one thing to possess confidence when things proceed as planned, but imagine the strength that is gained in staying unified when things appear to be going sideways. The Cisco team applied the lessons back at the (virtual) office. They became much more verbal about shifting leadership roles, and, as Lori recalls, “much more intentional about where we were going.” They do not have the luxury of “observing” leadership and body language, but they did have a collective heightened awareness about communication while participating in video and phone meetings. Known after the TeachingHorse program as “the lead mare,” Lori learned a lot about shared leadership, stating, “It’s OK to let go; it is not necessarily a loss of control.” Overall, the TeachingHorse experience left the team with skills, knowledge, and positive energy.